Duratron® CU60 PBI is the highest performance engineering thermoplastic available today. It offers the highest heat resistance and mechanical property retention over 400°F of any unfilled plastic (see Figures 26 & 27). It has better wear resistance and load carrying capabilities at extreme temperatures than any other reinforced or unreinforced engineering plastic. As an unreinforced material, Duratron CU60 PBI is very "clean" in terms of ionic impurity and it does not outgas (except water). These characteristics make this material very attractive to semiconductor manufacturers for vacuum chamber applications. Duratron CU60 PBI has excellent ultrasonic transparency which makes it an ideal choice for parts such as probe tip lenses in ultrasonic measuring equipment. 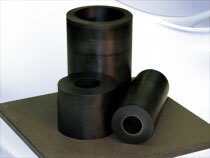 Duratron CU60 PBI is also an excellent thermal insulator. Other plastics in melt do not stick to Duratron CU60 PBI. These characteristics make it ideal for contact seals and insulator bushings in plastic production and molding equipment.